A main difference between a smartphone and any other phone is that smart phones can tell you where they are. What does location tell you? Location provides context about what you are doing, where you’re going, and by extension, who you are. Apple makes it easy to show this information on a map with MapKit. At the Flatiron School, I got a good foundation for learning frameworks, but hadn’t worked with MapKit yet. Since it felt core to many mobile apps, I decided to explore it. Here is a demo of the finished app. All the code is on Github. Whenever I get into a new framework, I learn best by jumping right in and doing it. Tutorials are a great way to get started. They help me focus by limiting scope and stay productive before my natural curiosity wants to go down some rabbit holes. I also don’t want to reinvent the wheel. 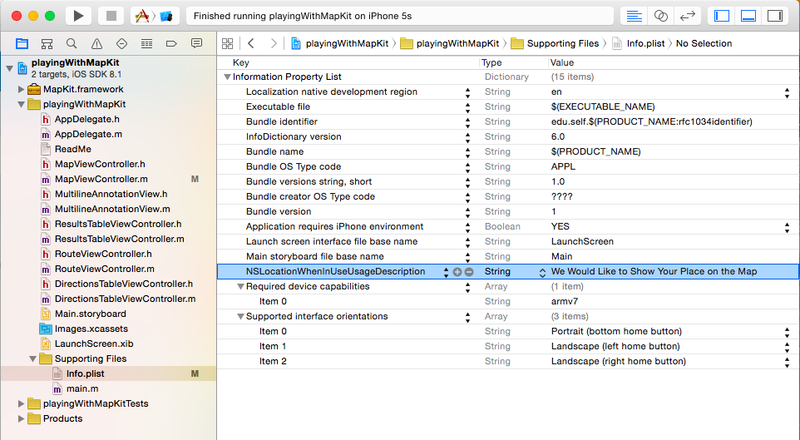 Searching for iOS Mapkit tutorial, I find some by Ray Wenderlich, TechTopia, and AppCoda. All three have been really useful in the past. I went with the TechTopia one because it was written about iOS 7. *Most of this is already well explained in the tutorial. I want to point out two bumps on the road. 1. Simulator does not have a GPS, so you have to set the location by the menu bar: Debug -> Location -> Custom Location. Google maps will give you latitude and longitude for any location if you click on the map. If it’s an icon, right click and click “What’s here?”. Note: Sometimes the location doesn’t show up in the simulator the first time I run it. When I run it on another sized simulator, it works. Don’t know why this is. 2. More importantly, iOS 8 requires that you get permission to use the user location. Here I have my CLLocationManager as a property of the class. Change self.locationManager to the name of your locationManager. Even though you think you’ve requested authorization, you are likely still missing one more piece. In the Supporting Files Folder of your app directory, there is a Info.plist file. It’s a properties list that your app uses through out the app. You have to have a property in there for NSLocationWhenInUseUsageDescription (or NSLocationAlwaysUsageDescription depending on which permission your asking for), which tells the customer why you are asking for their location information. There is a delegate method for the location manager that tell you when the authorization status changes. The status here is the CLAuthorizationStatus. Remember to set the locationManager’s delegate to the class that implements the delegate method. In this case, I’ve set the delegate to self inside my view controller. This was pretty straight forward. Apple makes the searches super easy by giving you completion handlers. You just need a MKLocalSearch object and a MKLocalSearchRequest object. The tutorial sets up a custom UITableViewCell, but that’s not really necessary because you can set the title as the name and the subtitle to the phoneNumber. Why am I in the middle of the ocean? Otherwise, you’ll find yourself in the ocean next to West Africa a lot (that’s what happens when your coordinates are (0,0)).